This exotic grouping is larger than life in person . When you are standing next to it, the blooms are literally in your face. These exotic flowers will last a very long time, but the water with the Decorative Pink Pineapple, pink Protea, and orange Pincushion Protea will have to be changed more often. These will make a dramatic display in your entry way or on a buffet table. Cymbiduim Orchids are in bloom in Southern California. My friend let me cut these beautiful yellow orchids that she grows in her yard. 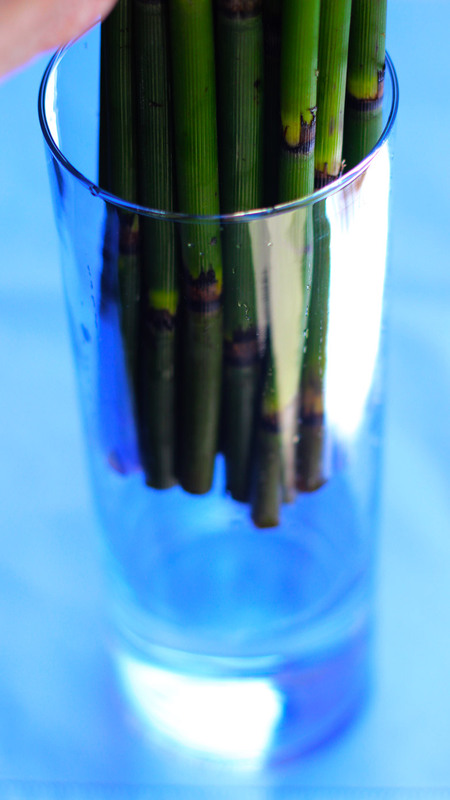 And once you purchase the glass cylinders you will be able to use them for many other arrangements. Well, if you have your flowers this grouping is easy. Let's begin. Fill vase for Proteas 2.5 inches from top. Fill other 2 vases 4- 6 inches from the bottom. Give fressh cuts to all stalks. Insert pink Protea, orange Pincushion Protea on left and Decorative Pink Pineapple on left. 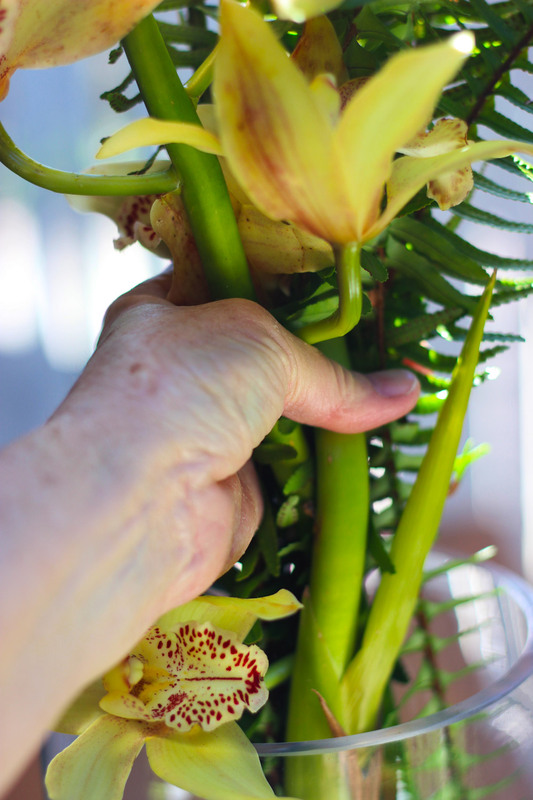 Make a grouping of yellow orchids and ferns in your hand. Put hand held grouping into large cylinder. This is the largest arrangement of the grouping. 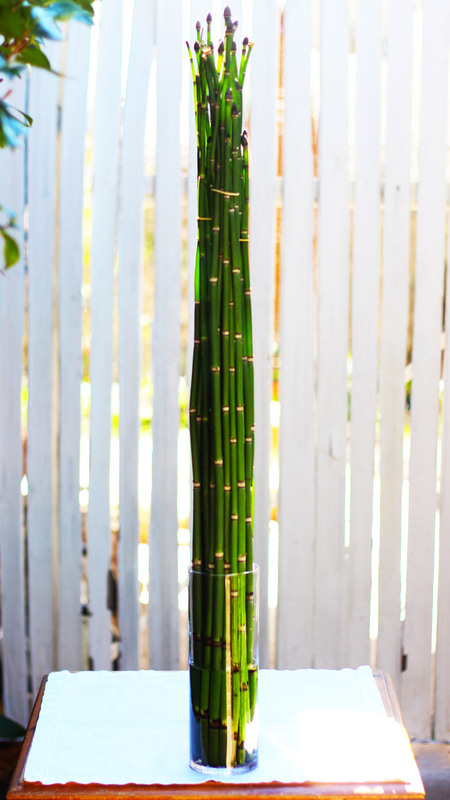 Cut ends of Horsetail and put into narrow vase. Keep rubber bands on until you replace them with a raffia tie. Tie one thin piece of raffia around all 3 buncles with a double knot. Trim short, then cut rubber bands off. The Horsetail even alone is very dramatic. Top lit by sunlight. The orange Pincushion Protea and the pink Protea. Here are some close ups. The ferns have little brown dots on them. The orchids have orange red dots on them. Close up of orange Pincushion Protea. This is the Decorative Pink Pineapple. Fun. And you are done. These are displayed with blue and white candle holders. Enjoy.